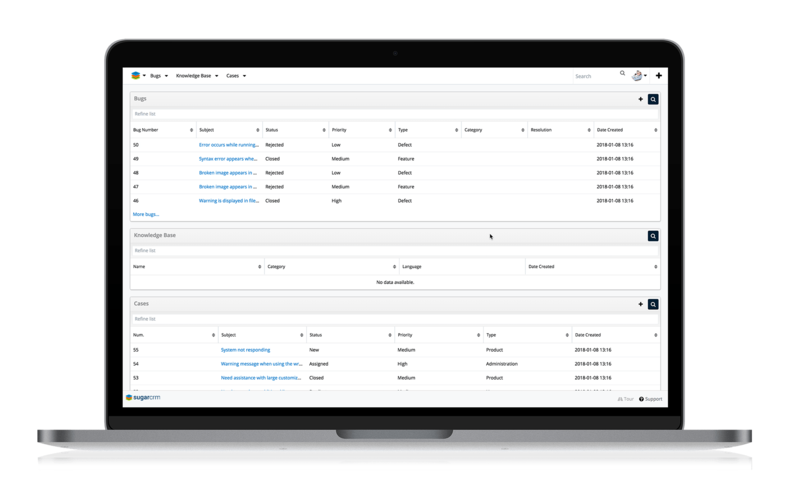 Customers can create cases, upload relevant information, search the knowledge base, and track cases to resolution without ever having to pick up a phone. All cases automatically appear within the Sugar Cases module. The self-service portal allows individuals to easily update their contact information and opt-out of newsletter subscriptions. Expose support knowledge to customers through FAQs and knowledge base. Reduce the number of inbound support calls by offering a self-service environment. Sugar Administrators can easily tailor the entire self-service user experience such as layout changes and custom fields through Sugar Studio. Available on Sugar Enterprise and Sugar Ultimate editions.